I was reading Love Warrior, Glennon Doyle Melton’s stunning memoir, when I got a pedicure last week. I had been carrying the book around with me everywhere because it seemed like Melton was talking to me personally, urgently, and I could not bear to close the cover on her. This hadn’t posed a real problem until I found myself sniffling around page 200, as my feet were getting scrubbed. A sympathetic nail tech fetched me a tissue before my mascara started to run, but even if it had smudged all over my face I would have continued reading, because Melton’s voice is an unstoppable force: earnest, dynamic, and big-sisterly. In Love Warrior, Melton describes her longtime struggles with what she calls a hot loneliness. Now in her early 40s, she reflects on how she spent most of her teens and twenties turning to bulimia and alcoholism to avoid dealing with her physical and emotional disquiet. But after years of numbing herself and pushing away loved ones, she arrived at a crossroads on her bathroom floor, drunk, pregnant, and ambivalent about her boyfriend. Addiction, marriage, adultery, motherhood, feminism, grief, spirituality, and mindfulness are all front and center in her swiftly moving book. Melton looks long and hard at these themes and arrives at some remarkable conclusions that will resonate deeply with many readers. Among them: “The only way to survive is to make no sudden movements, to get comfortable with discomfort, and to find peace without answers.” Yet even with all her hefty truth-telling, Melton manages to be downright funny throughout. 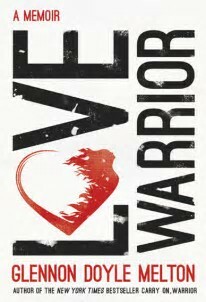 Love Warrior presents just one piece of Melton’s engrossing story. If, after finishing this beautifully written memoir, you long for more of her vital, courageous voice, check out her social media platforms, including her Momastery blog. You might be astonished at the extraordinary path she’s taken since the book’s publication.